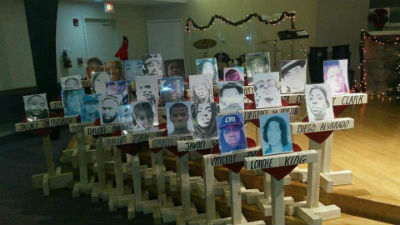 Photo: Crosses displayed with victims’ pictures inside the church. Approximately eight hundred murders rocked Chicago in the last year alone. Gang violence is on the rise in many large cities across the country, and Chicago is no exception. While many would rather retreat to the suburbs and write off urban centers as a loss, there is a growing movement of people that won’t give up on the youth, the children, and the families of densely populated areas. The grim statistics might suggest the forces of evil have completely taken over cities like Chicago. But soldiers of the cross like Greg Zanis are fighting side-by-side with congregations like Restoration Church of nearby Aurora, Illinois, to take back their cities. Recently, this reclamation effort took the form of one cross built for each of the eight hundred victims. Pastor Manny Rivera met Greg Zanis back in September. Known across the country for making crosses to commemorate the lives of victims of violence, Greg had been asked by a minister in Chicago about the possibility of building a cross for the families of every homicide victim in 2016. Meanwhile, a new family had been introduced to Restoration Church through a back-to-school outreach. When a location was needed to host a prayer vigil that would feature all eight hundred crosses, the Spirit persisted in bringing Manny’s name to Greg’s mind. 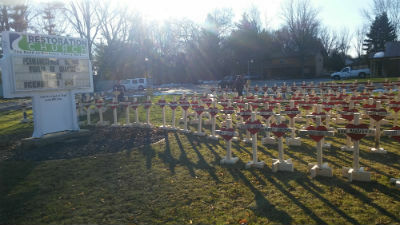 Photo: Crosses placed on the church lawn just before the vigil. For three weeks straight, Greg labored over each wooden cross, storing each one inside the walls of Restoration Church until the December 30 vigil. Over the course of those three weeks, members of the church prayed over these crosses and wrote notes of encouragement on each one. The names of the deceased were also written on each one, representing victims of senseless crimes across the spectrum of ages—the youngest, a one-month old; the oldest, eighty-one. The December 30 vigil, and subsequent march on Chicago the next day, attracted local and national media. The prayer vigil, which first unveiled the eight hundred crosses spread across the church property, also featured Pastor Jarad Houser of Shorewood Church of God in Shorewood, Illinois, as well as Eric Livingston, the state minister for Illinois Ministries of the Church of God. Prayer, candle-lighting, and a sermon delivered by Pastor Manny—translated from Spanish into English by his wife Marcy—rounded out the evening. 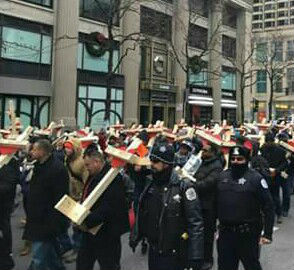 Photo: Carrying the crosses at the march in Chicago on December 31. This is where the church comes in. Reclaim what hell has stolen. That’s the power of the cross. Restoration Church, formerly First Church of God, is doing just that. The multicultural congregation is actively reaching out to people from various backgrounds, helping to restore broken marriages, lead people out of drug and alcohol addiction, and ultimately stem the tide of violence. They seized the opportunity to host a powerful prayer vigil for their community. They’re not a large church, so they can’t do everything. But they’re doing something. Your church can, too. This entry was posted in All Church of God, Great Lakes and tagged Aurora, Chicago, city, crosses, gang violence, Greg Zanis, homicide, Illinois, Manny Rivera, march, Marcy Rivera, murder, prayer vigil, Reclaim, reclamation, renewal, restoration, Restoration Church, urban, victims. Bookmark the permalink.